After Grand Rapids litigator Bruce Courtade took oath as 78th president of the State Bar of Michigan on Sept. 20 at DeVos Place, he emphasized that bar dues would not be raised under his watch*. 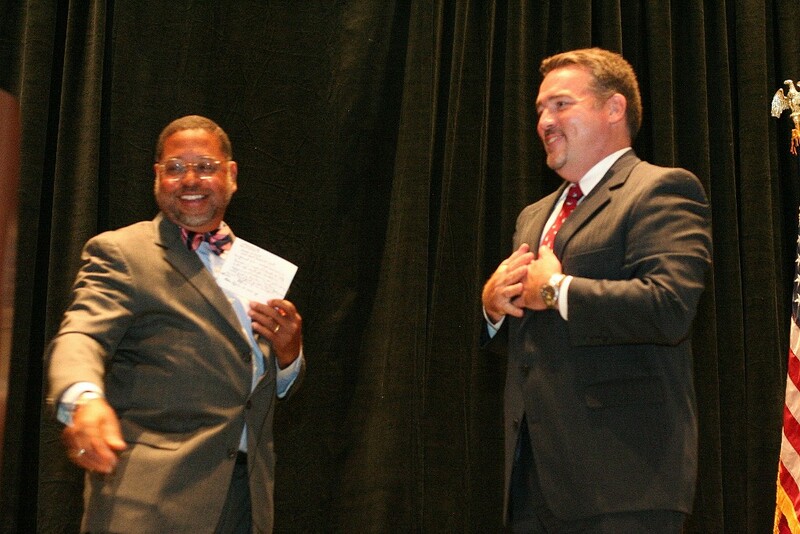 Bruce Courtade (right) acknowledges the crowd after being sworn in as 78th State Bar of Michigan president by Michigan Supreme Court Chief Justice Robert Young Jr.
Why? “Because Jenny will kill me,” he said to a roomful of laughter. He was referring to his wife, Jenny DeLessio, who also is an attorney. All kidding aside, Courtade said he’s ready to lead the 2012-13 year by moving forward with the SBM’s strategic plan, and with what has been recently put into place. He noted that the SBM’s Solutions on Self-Help Task Force has gotten SCAO-approved forms accessible via the web for people who can’t afford a lawyer to take to court. The Q&A-style forms are in fourth-grade English and will help in uncontested divorces and PPOs. And, as he told Michigan Lawyers Weekly in a recent article, he wants to push for civics education in schools, and making citizens aware of the Constitution and their constitutional rights. To show his seriousness on that, he made sure a copy of the U.S. Constitution was on each table at his swearing-in luncheon. Michigan Court of Appeals Judge Michael Riordan announces Dana Warnez as the newly sworn in chair of the Representative Assembly. 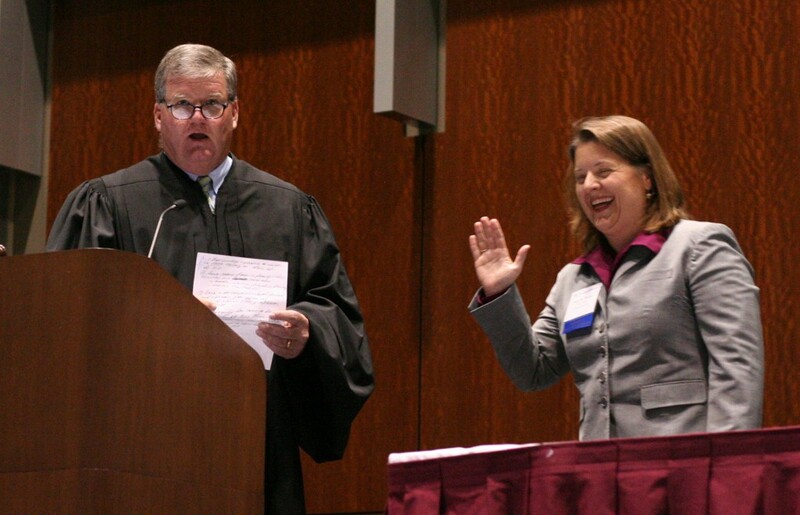 Right next door, at the Representative Assembly, Dana Warnez was sworn in as its 2012-13 chair, with Court of Appeals Judge Michael Riordan leading the proceedings. The RA also elected Vanessa Williams as its new clerk. *As an earlier blog post noted, SBM dues actually have been reduced. While only a fraction of State Bar of Michigan members are going to be at the SBM annual meeting in Grand Rapids today and tomorrow, Executive Director Janet Welch noted that something’s happening today that affects all members: dues invoices are going out. State Bar of Michigan Executive Director Janet Welch addresses attendees at the kickoff of the ICLE 2012 Solo and Small Firm Institute, held in conjunction with the SBM meeting in Grand Rapids. And, for the first time since 2004, there will be a change in the dues amount. 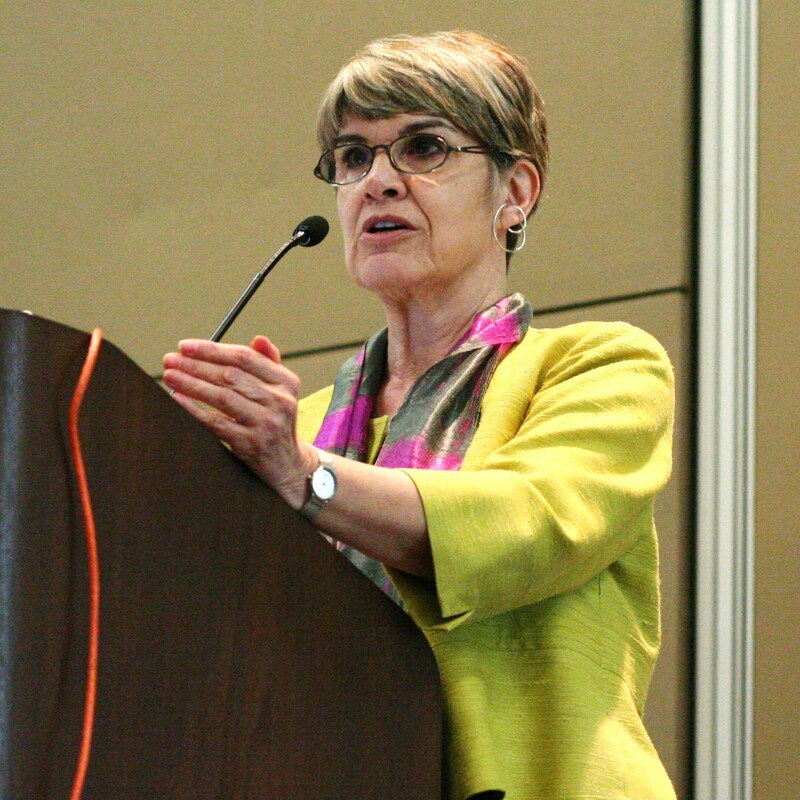 “Your dues are going down,” she said at her annual welcome and report at the kickoff of the ICLE 2012 Solo and Small Firm Institute, held in conjunction with the SBM meeting at DeVos Place. This is thanks to a recent Michigan Supreme Court order that called for the decrease of the disciplinary portion of annual dues effective this bar year by $10, something the Representative Assembly has historically lobbied for (only the high court can set dues amounts). This time around, the Supreme Court acted on this on its own. “We are below the national average in our dues, and I think we can make a good case that we are giving you more for your money than other states’ bar associations,” said Welch, who pointed to two examples for the coming year. One of the most popular member benefits is the daily eJournal case summary email, which Welch said has summarized almost 50,000 cases since it was launched in 1999 as the first electronic daily case summary service in the country. This year, the eJournal added CaseMaker, which allows SBM members free access to its legal research software, and new features have been added to it based on what members asked for – such as faster search results with a more intuitive interface, personalized search history and customizable folders. Then there’s the Practice Management Resource Center, the SBM’s online resource for solo and small firm management, which has refreshed a lot of its content thanks to the encouragement of outgoing State Bar President Julie Fershtman, who formed a task force last year seeking for ways to improve it. Resources in financial management, calendaring, client relations, marketing, best practices and disaster policies, record retention and IOLTA have been updated, and a new library of law-related e-books via the Overdrive software is about to launch. In addition, Welch said that a new mentoring database, the JobTarget Mentor Board, is being developed to bring seasoned Michigan attorneys together with new ones. That’s something that’s going under the watch of incoming SBM President Bruce Courtade, who will be sworn in later today. Check with the Michigan Lawyer blog later today for more on that. Next week, the State Bar of Michigan will be at the Supreme Court of the United States — not as a means of seeking justice, but in recognition for helping others do so. The SBM is one of five organizations chosen to receive the 2012 American Bar Association Grassroots Advocacy Award, for its efforts to increase funding for the Legal Services Corporation. LSC helps provide legal aid for low-income Americans and is the nation’s single largest provider of civil legal aid to citizens who live on incomes below or near the poverty line. The bar “worked to prevent a potentially devastating $104.2 million (25.7 percent) proposed cut to the LSC budget of $404.2 million in fiscal year 2010. While the House of Representatives proposed funding LSC at $300 million, the Senate favored an allocation of $396 million. Ultimately, funding was set at $348 million, thanks in large part to efforts such as” the SBM. The award will be presented April 18 as part of ABA Day 2012. Two weeks after she was sworn in as 77th president of the State Bar of Michigan, Julie Fershtman went to her doctor’s appointment. The doctor discovered a lump in her breast. She later was diagnosed with Stage 1 breast cancer. And though the carcinoma was small — 1.9 cm — and had not spread to any lymph nodes, she underwent a double mastectomy per her doctor’s precaution. It’s now been two weeks since her fourth and final chemotherapy treatment, and she is spreading the message on the importance of prevention and detection. “No matter how busy women are in this profession, there’s always time to go out and visit your doctor and get tested,” Fershtman told Michigan Lawyers Weekly. The timing couldn’t have been worse for her once the lump was detected. Her associate, with whom she had worked for four years, had just moved on to another opportunity. And after years of moving up the chain of leadership at the State Bar, Fershtman was about to leave for the Upper Peninsula as part of her presidency tour. There was nothing she could do until she came back, when the more invasive tests would be done. Her surgery took place before Thanksgiving, and her chemotherapy began near Christmas, periods when there’s a lull in State Bar activity. She still managed to go to every holiday party she was invited to. And, by using specially designed ice helmets for her chemo treatment, she didn’t lose any of her hair. She said that the only time she broke down in tears was when her surgeon told her she’d need six weeks off work. That worry was for naught, as she was back in the office 1 1/2 weeks later. And she said she had a support system at her firm, Foster, Swift, Collins & Smith PC, to cover for some of her matters when she had to go in for diagnostic tests. She noted that keeping a full schedule helped her stay centered, but she was worried about what people would think of her, especially when she told some people about it. But she was surprised when the few people she did tell would pass along a name to her of someone who also had breast cancer. A fellow State Bar member sent her pink ribbon silicone bracelets and pins, and Fershtman plans to pass such accessories onto other women as motivators. She’s happy to know that “this network of survivors is growing,” and plans to be a part of it for the Susan G. Komen Mid-Michigan Race for the Cure in Lansing on April 29, wearing a survivor’s hat. “Nobody can feel cancer until it’s too late,” Fershtman said, noting that Kim Cahill, one of her mentors, died of cancer a few months after her term as 72nd State Bar president ended. What’s going on with the SBM president these days? We’re almost at the point when we can write a headline saying “State Bar of Michigan President Julie Fershtman: The First 100 Days,” but we’ll jump the gun a bit here. Over a cup of Earl Grey tea at a Starbucks near her Foster, Swift, Collins & Smith, P.C. office, the 2011-12 SBM president reflected on all the things she’s either worked on, witnessed, or simply felt good about since her Sept. 15 inauguration. First is the task force Fershtman formed to enhance the SBM’s Practice Management Resource Center (PMRC). Headed by Rebecca Simkins, it’s working on coming up with recommendations by April — some of which could be instilled immediately, others may be long-term goals. But it’s been getting the word out about the PMRC overall that Fershtman said has given her the greatest satisfaction. Meeting with bar associations across the state, she said practitioners have been receptive to taking advantage of the service, which offers bar members training and hands-on assistance with legal technology and management components. She noted that many of the bar members she’s met haven’t known much about the PMRC, and she hopes the task force helps to change that. That leads to hearing from bar members directly. Fershtman did say in her incoming speech that she wants to be the most accessible SBM president in history — complete with a presidential blog — and has kept her word by taking emails and calls from practitioners, spending upwards of an hour on the phone listening to what they have to say. “I’m encouraged that they are comfortable enough to make the call,” she said. Fershtman added that she’s also encouraged by the SCAO report calling for the elimination of 45 judgeships across the state — per the SBM’s Judicial Crossroads Task Force’s report — which she said wasn’t met with the kind of resistance as expected, as it’s attrition-based, “which is what we were seeking.” As well, she said Gov. Rick Snyder’s recently formed Indigent Defense Advisory Commission looks promising. Still to go at the bar, she said, is better educating the public on the unauthorized practice of law, as well as the “Solutions on Self-Help” project, meant to give in pro parties some direction as to the proper court forms they need, and thus not wasting judges’ time. Not bad for 100 days. Or something close to that. The Michigan Supreme Court is seeking comments on a proposed amendment of Michigan Rule of Professional Conduct 7.3, ADM File No. 2010-22. The proposal, sponsored by the State Bar of Michigan, would place limitations regarding attorney solicitation of potential family law clients. [I]n any matter that involves a family law case in a Michigan trial court, a lawyer shall not initiate contact or solicit a party to establish a client-lawyer relationship until the initiating documents have been served upon that party or 14 days have passed since the date the document was filed, whichever action occurs first. This limitation does not apply if the party and lawyer have a pre-existing family or client-lawyer relationship. For purposes of this rules, “family law case” includes the following case-type code designations from MCR 8.117: DC, DM, DO, DP, DS, DZ, NA, PJ, PH, PP, or VP. The comment period for the proposal closes March 1, 2012. Send comments in writing or by email to: Supreme Court Clerk, P.O. Box 30052, Lansing, MI 48909, or MSC_clerk@courts.mi.gov. Reference ADM File No. 2010-22.